Gold remains vulnerable to a collapse although not instantly. A monthly closing beneath 1532 will signal that a drop to the mid-1100 zone is likely. The Goldbugs have already been banning together to try to make sure no one listens to anything I have to say. They remain bent of BUY AND HOLD and are against the idea of trading. If gold declines, it is a plot rather than the absence of analysis. They respond no different than any other group who try to shut down everything that disagrees with their views the same as government. As they say, the truth will set you free, but first it will piss you off. Unfortunately, the simple fact is gold has rallied for 13 years. The Goldbugs have sold gold to just about everyone who would listen. Instead of helping people survive, It is all about desperately trying to keep the balloon inflated and sell even more to the same people. The Japanese tried that too – it failed. The object is to go with the flow. Stop trying to dictate to the market and you will survive. There is a time and place for everything. Gold is just not ready for prime time right now. The German elections are in September and most will sit on their hands waiting for Merkel to be reelected. If she is not, Europe will fall apart and then watch gold. Markets decline when everyone is long, they start to sell, and there is no bid. You simply run out of energy to keep moving in the same direction. Our Energy Model is still showing an overbought position of $332. The peak was September 2011. The entire rally began when our Energy Model turned negative -$30 in April 2010. Gold thus began a rally at the start of the Sovereign Debt Crisis with Greece that month. The correlation of gold to the Sovereign Debt Crisis is 86%. The biggest obstacle right now is the targeting of the gold market by all governments. Gold will remain the alternative underground medium of exchange, but never the above ground monetary unit. Our biggest danger is the government will just seize records of everyone that sells gold and start their trace. They have already imposed regulations on refiners demanding they track the movement of all gold. France has shut down the gold market prohibiting the purchase of gold for cash. Governments NEED money and they will be very nasty before this whole thing collapses..They just will not go quietly into the light. 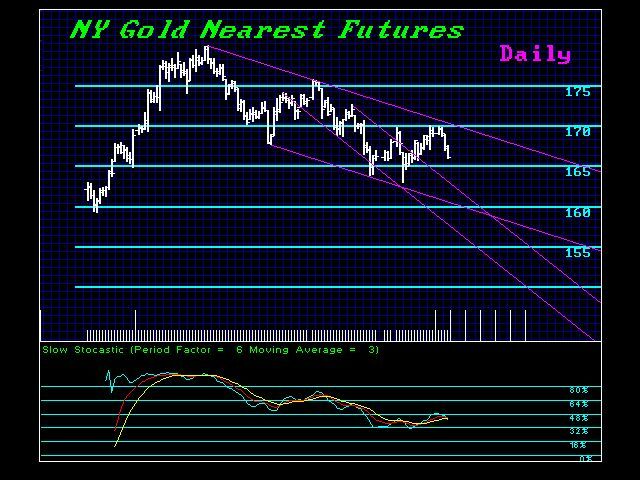 We can see that gold has remained confined within the Downtrend Channel on the daily level. It is not likely that we will break the 1532 area just yet. Technical support lies above that area slightly suggesting that we will see a test of that region followed by a bounce. While gold is tired after rallying 13 years, it does not appear to be a bubble. Instead, it will work its way to support. However, the market will have to shake the tree and force a number of people to liquidate before a rally emerges in 2015 into 2021-2022.. 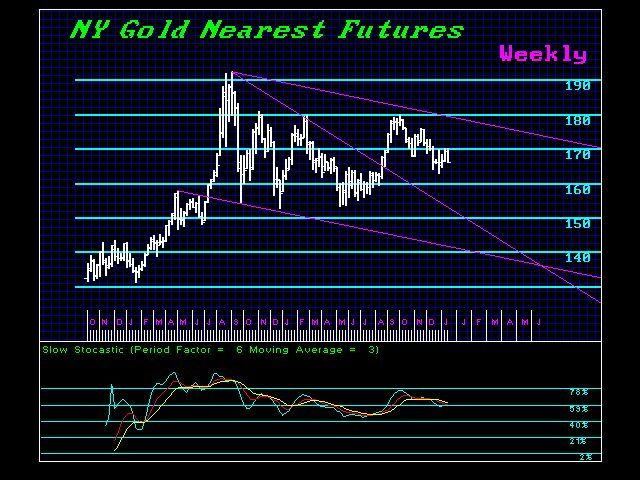 The weekly level also shows that gold has remained in an orderly decline so far remaining within the breakline channel. Without a further collapse in the Sovereign Debt Crisis immediately, gold is treading water. It still appears that capital will shift into private assets and this will aid the rise in interest rates in 2013 into 2015. 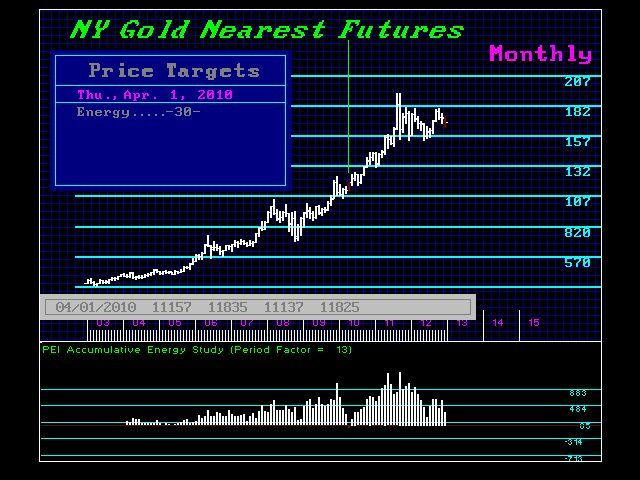 However, it will be the turn in the Economic Confidence Model in 2015 that will bring the curtain down and gold should then rally to new highs going into 2021. « Dow Off to New Highs?